> Research Library > Absorb > ebook: Thriving or Surviving? Your LMS and You: Thriving or Surviving? Technology. Shoes. Milk. Nothing lasts forever. Your LMS is no different. 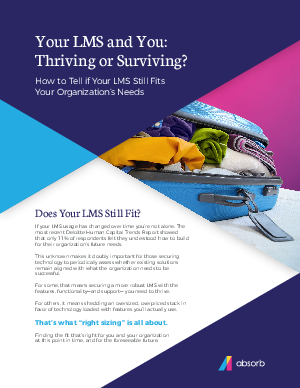 But how can you tell if it's time to call it quits with your current LMS? Well, it starts by asking the right questions.